would believe, that he was not happy. his bird down, until finally Gray decided to build Pepper his own Bird Buggy. Pepper is now owner and operator of the Bird Buggy, which is is favored method of transportation through his owners' home. 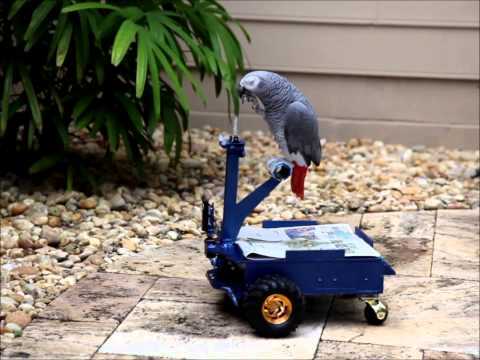 All with his beak, Pepper drives the Buggy forward and back and makes turns to the left and right by pushing the Buggy's joystick. But the Buggy also has a robotic mode for it to seek out its charging system when Pepper goes to bed or when the Buggy battery gets low. Additionally, there are sensors in the front of the vehicle to keep Pepper from bumping into things. Gray told ABC News that the Bird Buggy design was successful in quieting his bird, but also it might "get me a job down the road." Your Dose Of Cuteness For Today -- The Animal Video Of The Day!! !